This morning our beloved Lord Sai appeared in my dream. For the past few days I have been concentrating on a particular quote by our Swami: "When you spend your hours in thoughts about GOD, you are also free from evil ways. You will not be tempted to abuse others or harm them in any way. You will live in Love, accepting all the events of life as His gifts." This celestial statement is very poignant for me because I have been working on staying centered in Divine Love. Divine Love is who and what we essentially are. The Master Jesus exemplified this unconditional, selfless love. As we celebrated the Christmas season this year, I contemplated the majesty and astounding depths of Christ's far reaching Divine Love. His beautiful message of peace on earth, goodwill toward men, sacrifice of ego and body consciousness is truly phenomenal. He was the epitome of Divine Love. As the dream unfolded: I was preparing to travel across the country to meet with some persons of interest. I arrived at my destination and was waiting in the corridor of a large building. While I waited I saw my husband David walking by. He has been having some health challenges lately and his gait was awkward and shaky. I ran up to him inquiring if he was okay. He seemed in a hurry and said he would meet me inside. I gathered my stuff up and walked to the entrance of an extensive cafeteria, joining the line for lunch. There was one woman on the line who seemed to be in a hurry, I asked her if she was from a big city, since people from the city are usually in a hurry. She smiled at this comment. After getting my plate this portion of the building expanded onto a colossal beach. There were people sitting in groups on this beach. I sat down in one section wondering where David was. I heard David's voice and then saw where he was sitting, I prepared to join him. 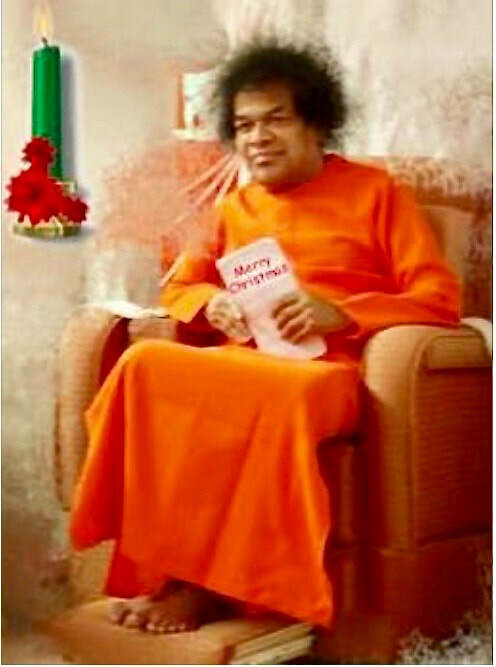 Then I turned my head and saw Sathya Sai Baba sitting at the edge of the section I was in. There were devotees kneeling taking padanamaskar. I could see Swami's eyes, a brilliant light emanated from His divine orbs. I leaped up running over to Him. As I approached Sai Avatar the corner of a tent appeared to be blocking my way. I worked my way around it and fell at our Lord's feet. Swami had what looked like some sort of chapstick and rubbed both of my eyes with the holy ointment. Then I started waking up. Embodiments of Divine Love, let us resolve to become more of who we really are in the coming New Year and delve, dive into the Christ-like, baptismal ocean of Love.